To Cite: Kazeminezhad S R, Shaffaf T, Romer F. In Silico Analysis of the Novel Variant Q375R in the Phenylalanine Hydroxylase Gene, Gene Cell Tissue. 2019 ; 6(1):e89961. doi: 10.5812/gct.89961. Background: Phenylketonuria is an inborn metabolic disorder inherited in an autosomal recessive pattern. The detection of pathogenic variations improves the power of at-risk carrier and prenatal detection. We previously found Q375R a novel phenylalanine hydroxylase variation in phenylketonuria patients from the south-west of Iran. Objectives: Here, we aimed to evaluate the rate of the pathogenicity of this novel variant and three other intron variants (IVS9 + 32insA, IVS11 + 163delC, and IVS12 + 30C>T). Methods: The pathogenicity and some structural features of Q375R were analyzed using bioinformatics tools including SIFT, PolyPhen, Mutpred, MutationTaster, nSSNP Analyzer, SNP effect, 3DLigandSite, GeneSplicer, Human Splicing Finder, MaxEntScan, and FSPLICE. Results: According to the SIFT, PolyPhen, Mutpred, and MutationTaster reports, Q375R could be disease-causing. SNAP predicted Q375R as an intermediate damaging variation and nSSNP Analyzer predicted this variation to be neutral. I-Mutant3.0, FoldX, and Mustab showed a decrease in phenylalanine hydroxylase stability upon Q375R alteration. Conclusions: 3DLigandSite predicted that phenylalanine hydroxylase binding sites vary in mutant and wild-type proteins. Q375R could be considered an effective factor in the structure and function of phenylalanine hydroxylase. This may be useful in clinical detection of phenylketonuria in Iranian patients and their at-risk relatives. However, we need to do complementary in vitro and in vivo functional assessments for the evaluation and validation of the effects of this variation on phenylalanine hydroxylase function and structure. Deficiency of phenylalanine hydroxylase, an enzyme produced by the liver, leads to phenylketonuria (PKU), which is an autosomal recessive genetic disorder affecting the metabolism of phenylalanine. Phenylalanine (1) is converted to tyrosine by phenylalanine hydroxylase (PAH; EC 1.14.16.1) (1, 2). The defective enzyme leads to the accumulation of Phe in blood and body fluids of PKU patients (3) and can cause seizures, severe intellectual disability (mental retardation), and other diseases in untreated cases. The incidence of PKU is one in 3627 live births in nine of all Iranian populations, but it differs among others (4, 5). Mutations in the PAH gene on chromosome 12q23.2 occur in 98% of PKU patients (6). So far, over 600 different mutations have been identified in PAH that are listed in databases of PAH and HGMD. A high percentage of them are point mutations arising from single base substitution (2, 6). PAH enzyme dysfunction mechanisms depend on the PAH gene mutation location and type (7). The major damaging effect on its structure and function is caused by improper folding resulting in decreased protein stability and causing degradation (8). Bioinformatics studies of nonsynonymous genetic variants effects could help identify more likely disease-causing variants. As experimental studies are expensive in nature (and due to the difficulty that it entails), several studies have used bioinformatics analysis to predict potentially damaging effects of nonsynonymous single nucleotide polymorphisms (SNPs) in humans (9). Jahantigh and Hosseinzadeh Colagar used in silico analysis to evaluate the biological function of rs6147172 and rs2267437 SNPs. They predicted the effects of this variation on the splicing of XRCC7 mRNA by using HSF3, Human Splicing Finder version 3, SplicePort, and SpliceAid 2 (10). Ernst et al. classified rare BRCA1/2 missense variants using four prediction tools, Align-GVGD, SIFT, PolyPhen-2, and MutationTaster2 (11). Macauda et al. used in silico analysis to evaluate the relationship between increased gene expression and variant alleles of four SNPs in linkage disequilibrium with ABCC2‐rs4148388 (12). Salimi et al. studied the association between systemic lupus erythematosus and ERα polymorphisms using in silico analysis (13). In the present study, an in silico analysis was designed to evaluate the pathogenicity rate of a novel variant Q375R (c.1124A>G) and three intron variants, IVS9 + 32insA, IVS11 + 163delC, and IVS12 + 30C>T (14). We had analyzed the phenylketonuria mutations in south-west Iran in a previous study. In summary, 40 unrelated hyperphenylalaninemia patients were selected. Blood samples were collected from all cases (2.5 - 3 mL). Diatom Prep 100 kit was used to extract DNA. PAH mutations in 6, 7, and 10 - 12 exons and the adjacent flanking region were studied using the polymerase chain reaction (PCR) with manually designed primers. After the purification of PCR products, an automated sequencing was performed using applied biosystems 3730 DNA analyzer (Macrogen, Seoul, Korea). The sequence alignment was evaluated using the National Center for Biotechnology Information (NCBI) BLAST tool. Totally, 13 different mutations were identified including six missense mutations, three nonsense mutations, three splice site mutations, and one deletion. Intronic regions of PAH contained three novel variants and seven various polymorphisms. The c.1124A>G (Q375R) alteration was a novel variant identified in exon 11. Three other new variants, IVS9 + 32insA, IVS11 + 163delC, and IVS12 + 30C>T, were detected in introns 10, 12, and 12, respectively (6). The Q375R variant was analyzed in silico. The evolutionary conservation of protein sequences was studied by PANTHER (protein analysis through evolutionary relationships) (15) and MutationTaster, a program using phastCons and phyloP to determine the given nucleotide conservation grade (16). Damaging effects of single nucleotide variation c.1124A>G were analyzed using seven tools: PolyPhen-2 (polymorphism phenotyping v2), MutPred, SNAP2 (screening for non-acceptable polymorphisms 2), SNPs&GO, SIFT (sorting intolerant from tolerant), MutationTaster, and nsSNPAnalyzer. SIFT is a tool predicting the effects of amino acid substitution on protein function (deleterious or neutral). This software uses the conservation degree of amino acid residues and the physicochemical properties of amino acids (17). The PolyPhen-2 tool utilizes a combination of sequence and structure-based attributes and uses naive Bayesian classifier for the identification of an amino acid substitution and the effects of the mutations (18). MutPred predicts the probability of amino acid deleterious substitutions and the molecular cause of disease-related amino acid substitutions (19). The SNPs&GO method uses protein functional annotation to predict the SAPs (single amino acid polymorphisms) (20). SNAP only uses sequence-based computationally acquired information and potentially classifies all nsSNPs (non-synonymous coding SNPs) into neutral and non-neutral classes (21). Based on the alteration type, MutationTaster makes a choice between three distinct prediction models (aiming at either intronic alterations or silent synonymous) at alterations affecting a single amino acid or at alterations which cause changes in the sequence of the amino acid (16). The nsSNP Analyzer server is able to integrate several protein structure analyses and sequence alignments to identify nsSNPs associated with diseases. nsSNP Analyzer uses the sequence of a protein and the accompanying nsSNP to report if an nsSNP could be disease-associated or it is functionally neutral (22). I-Mutant 3.0, foldX, and Mustab were used to predict the effects of the altered amino acid on the stability of the protein (19, 23). The variation was analyzed using SNPeffect (24). It provides a detailed SNP analysis using four tools: TANGO to predict aggregation regions, WALTZ to predict amylogenic regions, LIMBO to predict hsp70 chaperone binding sites, and FoldX to study the stability of the proteins. Structural analysis was performed using Swiss Pdb viewer 4.1.0 and phyre2, which is a web tool to predict and build 3D models (25). After that, the ligand binding sites were predicted using 3DLigandSite (26) and the structure was visualized by Molegro Virtual Docker 5.5. For understanding the effects of three novel non-coding variant sequences (IVS9 + 32insA, IVS11 + 163delC, and IVS12 + 30C>T) on RNA splicing, the variations were studied by MaxEntScan, FSPLICE, GeneSplicer, and human splicing finder. UniProt data were analyzed using Office to evaluate variant positions. Figure 1 shows the PAH gene, domains, and the position of the desired variants. The results of MutationTaster showed phastCons values equal to 1, indicating a higher probability of nucleotide conservation. In addition, phyloP showed a score of 4.96 (the closer the value to 6, the higher the probability of conservation). Evolutionary analysis of coding SNP in the PANTER tool resulted in a NIC value of 4.402. A smaller value of NIC indicates a higher probability of not being conserved in the multiple sequence alignment for the variation. Q375R was predicted to be deleterious using four tools, SIFT (score 0.00), PolyPhen (PSIS 0.985), Mutpred (score 0.816), and MutationTaster. SNAP predicted Q375R to be intermediate for damaging with a score of 46, but nSSNP analyzer predicted Q375R to be a neutral variant. The tools I-Mutant 3.0, Fold X, and Mustab evaluated the levels of stability in the protein. Fold X predicted that the mutation of Gln to Arg (position 375) results in a ddG of 0.83 kcal/mol. According to the result, the mutation moderately decreases the stability of the protein. The obtained results from other tools including Mustab (confidence of 83.04) and I-Mutant 3.0 (ddG of 0.06 kcal/mol, slight) also imply that the protein stability decreases upon Q375R variation. According to the output of the SNP effect, TANGO predicted the new variant effects on the aggregation-prone regions of the protein sequence. For Q375R, dTANGO equals 0.4, meaning that the aggregation tendency of the protein is not affected by this mutation (Table 1). aStart, end, sequence, and score are given for TANGO regions. The aggregation-prone regions predicted by TANGO were visualized in the protein structure (Figure 2). As an output of SNPeffects, Waltz predicted the new variant effects on amyloid-forming regions. For the Q375R variation, dWALTZ equals -537.22 which means this amino acid change decreases the amyloid propensity of the protein. Table 2 shows the differences between the aggregation profiles of the wild type and the mutant protein. aStart, end, sequence, and score are given for WALTZ regions. Figure 2. The molecular visualization of TANGO aggregation-prone regions. TANGO aggregation-prone regions are shown as red-colored segments in the molecular image. The structural location of the variant residue is colored in yellow. Chaperones are essential elements in controlling protein folding and degradation of misfolded proteins. 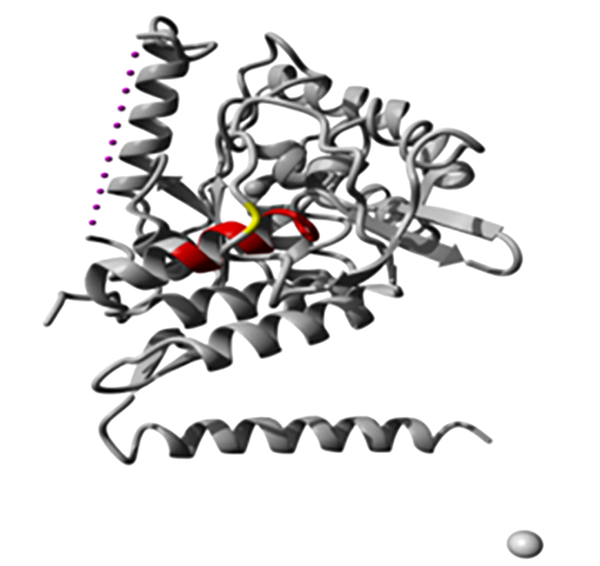 The results of LIMBO for the prediction of chaperone binding site shows dLIMBO equal to -0.92, meaning that the chaperone-binding tendency of the protein is not affected by the new variant. Short segments are listed in the table for both wild type and newly varied proteins. The results show an increase in one of the stretches from position 385 to 393 (Table 3). aStart, end, sequence, and score are shown for LIMBO regions. The overall 3D structure of PAH protein and the position of 375 amino acid were investigated using Swiss Pdb viewer 4.1.0 software (Figure 3). 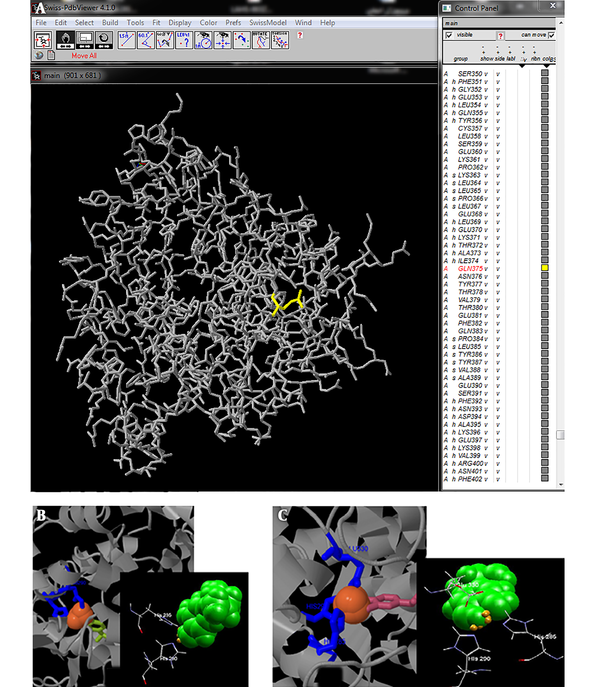 According to the phyre2 modeling and the result of 3DLigandSite, the HIS 285 and HIS 290 residues were predicted to be a part of the ligand-binding site in the wild type protein. For the varied protein, GLU 330 was present in PAH binding sites in addition to HIS 285 and HIS 290 (Figure 3). Three novel non-coding variants, IVS9 + 32insA, IVS11 + 163delC, and IVS12 + 30C>T, were predicted as polymorphism by GeneSplicer, Human Splicing Finder, MaxEntScan, and FSPLICE. Analysis using these software packages showed that the variations had no significant effect on RNA splicing. PKU, an autosomal recessive genetic disorder with metabolic impairment, is mainly caused by mutations in the PAH gene. These mutations mostly result in deficient enzyme activity and subsequently cause hyperphenylalaninemia. They occur mainly in the exonic and flanking regions of the gene. The majority of these variations are missense mutations. Untreated PKU can lead to intellectual disability, seizures, and other symptoms. Various single nucleotide variations (SNVs) can cause PKU (27). SNVs may affect folding, expression, binding affinity, post-translational modification, and other protein features (28). We can use bioinformatics tools to gather medical and biological information in order to predict the pathogenicity of different genetic variations (29). Thusberg et al. evaluated the performance of nine pathogenicity prediction tools including Panther, MutPred, PhD‐SNP, PolyPhen, SNAP, PolyPhen2, SIFT, nsSNPAnalyzer, and SNPs&GO using different human SNP databases; they disclosed that SNPs&GO was the best in accuracy and SNAP was better in NPV. They totally found MutPred and SNPs&GO the most reliable prediction tools for variants. They believe that there is no single method as the best tool for all parameters, so selecting the proper software and tools depends on the nature of the data (30). In the present study, we used many bioinformatics software packages and online tools to evaluate the mutations and the protein structure in different aspects and obtain more reliable results by using an acceptable number of tools. In our previous study, PAH mutations within exon 6, exon 7, and exons 10 - 12 were identified in 40 PKU patients in the southwest of Iran. The results showed one novel variation besides some previously reported ones. Q375R (c.1124A>G) was detected in exon 11 as a novel variant. Seven different polymorphisms in exonic regions and three new variants in intron regions of PAH were detected (14). In this study, we aimed to evaluate new variation potentiality for pathogenicity using various software packages and databases. The structural characteristics, stability, post-translational modifications (data not shown), and pathogenicity change predictions were checked for this new variation. The results showed that new variation Q375R is disease-causing according to the MutationTaster, polyphen2, and SIFT; however, other tools predicted this variation is neutral or intermediate damaging. Much evidence implicates protein misfolding in human diseases. Indeed, normal, correctly folded proteins are transformed from their proper structure into an abnormal structure, amyloid fibril (20). Q375R mutation decreases the amyloid propensity and the stability of the protein, and changes the residues in the binding site. Chaperon binding to the protein in PAH could take place due to the effect of this variation. Therefore, the variation could affect the half-life, folding, and functionality of PAH. However, the mutation did not affect the aggregation tendency and post-translational modifications of the protein. Despite the functional assays necessity for variation evaluation, these predictions shed light on the path of these assessments. Finally, it can be concluded that the new variation Q375R is likely deleterious and PKU causing; so, this variant could be used to diagnose PKU. In addition, the results showed that this residue alteration potentially affected some structural and stability features of PAH. However, in vitro and in vivo functional evaluation can provide certainty to this end and clarify some controversial and ambiguous results of predictive tools. Conflict of Interests: The authors have no conflicts of interest to declare. Ethical Considerations: It is not declared by the authors. Funding/Support: The study was funded by Shahid Chamran University of Ahvaz (registration code: 30483). The sponsor had no role in data analysis and drafting the manuscript. 1. Georgiou T, Ho G, Vogazianos M, Dionysiou M, Nicolaou A, Chappa G, et al. The spectrum of mutations identified in Cypriot patients with phenylalanine hydroxylase deficiency detected through neonatal screening. Clin Biochem. 2012;45(7-8):588-92. doi: 10.1016/j.clinbiochem.2012.01.026. [PubMed: 22330942]. 2. Zare-Karizi S, Hosseini-Mazinani SM, Khazaei-Koohpar Z, Seifati SM, Shahsavan-Behboodi B, Akbari MT, et al. Mutation spectrum of phenylketonuria in Iranian population. Mol Genet Metab. 2011;102(1):29-32. doi: 10.1016/j.ymgme.2010.09.001. [PubMed: 20920871]. 3. Blau N, van Spronsen FJ, Levy HL. Phenylketonuria. Lancet. 2010;376(9750):1417-27. doi: 10.1016/S0140-6736(10)60961-0. [PubMed: 20971365]. 4. Bagheri M, Rad IA, Jazani NH, Zarrin R, Ghazavi A. Mutation analysis of the phenylalanine hydroxylase gene in Azerbaijani population, a report from West Azerbaijan province of Iran. Iran J Basic Med Sci. 2015;18(7):649-53. [PubMed: 26351554]. [PubMed Central: PMC4556756]. 5. Koochmeshgi J, Bagheri A, Hosseini-Mazinani SM. Incidence of phenylketonuria in Iran estimated from consanguineous marriages. J Inherit Metab Dis. 2002;25(1):80-1. doi: 10.1023/A:1015154321142. [PubMed: 11999985]. 6. Groselj U, Tansek MZ, Kovac J, Hovnik T, Podkrajsek KT, Battelino T. Five novel mutations and two large deletions in a population analysis of the phenylalanine hydroxylase gene. Mol Genet Metab. 2012;106(2):142-8. doi: 10.1016/j.ymgme.2012.03.015. [PubMed: 22513348]. 7. Waters PJ, Parniak MA, Nowacki P, Scriver CR. In vitro expression analysis of mutations in phenylalanine hydroxylase: Linking genotype to phenotype and structure to function. Hum Mutat. 1998;11(1):4-17. doi: 10.1002/(SICI)1098-1004(1998)11:1<4::AID-HUMU2>3.0.CO;2-L. [PubMed: 9450897]. 8. Polak E, Ficek A, Radvanszky J, Soltysova A, Urge O, Cmelova E, et al. Phenylalanine hydroxylase deficiency in the Slovak population: Genotype-phenotype correlations and genotype-based predictions of BH4-responsiveness. Gene. 2013;526(2):347-55. doi: 10.1016/j.gene.2013.05.057. [PubMed: 23764561]. 9. Thusberg J, Vihinen M. Pathogenic or not? And if so, then how? Studying the effects of missense mutations using bioinformatics methods. Hum Mutat. 2009;30(5):703-14. doi: 10.1002/humu.20938. [PubMed: 19267389]. 10. Jahantigh D, Hosseinzadeh Colagar A. XRCC5 VNTR, XRCC6 -61C>G, and XRCC7 6721G>T gene polymorphisms associated with male infertility risk: Evidences from case-control and in silico studies. Int J Endocrinol. 2017;2017:4795076. doi: 10.1155/2017/4795076. [PubMed: 28421111]. [PubMed Central: PMC5379132]. 11. Ernst C, Hahnen E, Engel C, Nothnagel M, Weber J, Schmutzler RK, et al. Performance of in silico prediction tools for the classification of rare BRCA1/2 missense variants in clinical diagnostics. BMC Med Genomics. 2018;11(1):35. doi: 10.1186/s12920-018-0353-y. [PubMed: 29580235]. [PubMed Central: PMC5870501]. 12. Macauda A, Castelli E, Buda G, Pelosini M, Butrym A, Watek M, et al. Inherited variation in the xenobiotic transporter pathway and survival of multiple myeloma patients. Br J Haematol. 2018;183(3):375-84. doi: 10.1111/bjh.15521. [PubMed: 30079960]. 13. Salimi S, Mohammadpour-Gharehbagh A, Keshavarzi F, Farajian-Mashhadi F, Mousavi M, Sandoughi M. Association between ERalpha polymorphisms and systemic lupus erythematosus: Susceptibility and in silico analysis. Int J Rheum Dis. 2018;21(1):214-22. doi: 10.1111/1756-185X.13230. [PubMed: 29356461]. 14. Ajami N, Kazeminezhad SR, Foroughmand AM, Hasanpour M, Aminzadeh M. A preliminary mutation analysis of phenylketonuria in southwest Iran. Genet Mol Res. 2013;12(4):4958-66. doi: 10.4238/2013.October.24.7. [PubMed: 24301756]. 15. Thomas PD, Kejariwal A. Coding single-nucleotide polymorphisms associated with complex vs. Mendelian disease: Evolutionary evidence for differences in molecular effects. Proc Natl Acad Sci U S A. 2004;101(43):15398-403. doi: 10.1073/pnas.0404380101. [PubMed: 15492219]. [PubMed Central: PMC523449]. 16. Schwarz JM, Rodelsperger C, Schuelke M, Seelow D. MutationTaster evaluates disease-causing potential of sequence alterations. Nat Methods. 2010;7(8):575-6. doi: 10.1038/nmeth0810-575. [PubMed: 20676075]. 17. Kumar P, Henikoff S, Ng PC. Predicting the effects of coding non-synonymous variants on protein function using the SIFT algorithm. Nat Protoc. 2009;4(7):1073-81. doi: 10.1038/nprot.2009.86. [PubMed: 19561590]. 18. Adzhubei IA, Schmidt S, Peshkin L, Ramensky VE, Gerasimova A, Bork P, et al. A method and server for predicting damaging missense mutations. Nat Methods. 2010;7(4):248-9. doi: 10.1038/nmeth0410-248. [PubMed: 20354512]. [PubMed Central: PMC2855889]. 19. Li B, Krishnan VG, Mort ME, Xin F, Kamati KK, Cooper DN, et al. Automated inference of molecular mechanisms of disease from amino acid substitutions. Bioinformatics. 2009;25(21):2744-50. doi: 10.1093/bioinformatics/btp528. [PubMed: 19734154]. [PubMed Central: PMC3140805]. 20. Capriotti E, Calabrese R, Fariselli P, Martelli PL, Altman RB, Casadio R. WS-SNPs&GO: A web server for predicting the deleterious effect of human protein variants using functional annotation. BMC Genomics. 2013;14 Suppl 3. S6. doi: 10.1186/1471-2164-14-S3-S6. [PubMed: 23819482]. [PubMed Central: PMC3665478]. 21. Bromberg Y, Rost B. SNAP: Predict effect of non-synonymous polymorphisms on function. Nucleic Acids Res. 2007;35(11):3823-35. doi: 10.1093/nar/gkm238. [PubMed: 17526529]. [PubMed Central: PMC1920242]. 22. Bao L, Zhou M, Cui Y. nsSNPAnalyzer: Identifying disease-associated nonsynonymous single nucleotide polymorphisms. Nucleic Acids Res. 2005;33(Web Server issue):W480-2. doi: 10.1093/nar/gki372. [PubMed: 15980516]. [PubMed Central: PMC1160133]. 23. Teng S, Srivastava AK, Wang L. Sequence feature-based prediction of protein stability changes upon amino acid substitutions. BMC Genomics. 2010;11 Suppl 2. S5. doi: 10.1186/1471-2164-11-S2-S5. [PubMed: 21047386]. [PubMed Central: PMC2975416]. 24. De Baets G, Van Durme J, Reumers J, Maurer-Stroh S, Vanhee P, Dopazo J, et al. SNPeffect 4.0: On-line prediction of molecular and structural effects of protein-coding variants. Nucleic Acids Res. 2012;40(Database issue):D935-9. doi: 10.1093/nar/gkr996. [PubMed: 22075996]. [PubMed Central: PMC3245173]. 25. Kelley LA, Mezulis S, Yates CM, Wass MN, Sternberg MJ. The Phyre2 web portal for protein modeling, prediction and analysis. Nat Protoc. 2015;10(6):845-58. doi: 10.1038/nprot.2015.053. [PubMed: 25950237]. [PubMed Central: PMC5298202]. 26. Wass MN, Kelley LA, Sternberg MJ. 3DLigandSite: Predicting ligand-binding sites using similar structures. Nucleic Acids Res. 2010;38(Web Server issue):W469-73. doi: 10.1093/nar/gkq406. [PubMed: 20513649]. [PubMed Central: PMC2896164]. 27. Williams RA, Mamotte CD, Burnett JR. Phenylketonuria: An inborn error of phenylalanine metabolism. Clin Biochem Rev. 2008;29(1):31-41. [PubMed: 18566668]. [PubMed Central: PMC2423317]. 28. Katsonis P, Koire A, Wilson SJ, Hsu TK, Lua RC, Wilkins AD, et al. Single nucleotide variations: Biological impact and theoretical interpretation. Protein Sci. 2014;23(12):1650-66. doi: 10.1002/pro.2552. [PubMed: 25234433]. [PubMed Central: PMC4253807]. 29. Chang PL. Clinical bioinformatics. Chang Gung Med J. 2005;28(4):201-11. [PubMed: 16013339]. 30. Thusberg J, Olatubosun A, Vihinen M. Performance of mutation pathogenicity prediction methods on missense variants. Hum Mutat. 2011;32(4):358-68. doi: 10.1002/humu.21445. [PubMed: 21412949].